I usually just throw the apples in the pan – none of this fancy arranging! 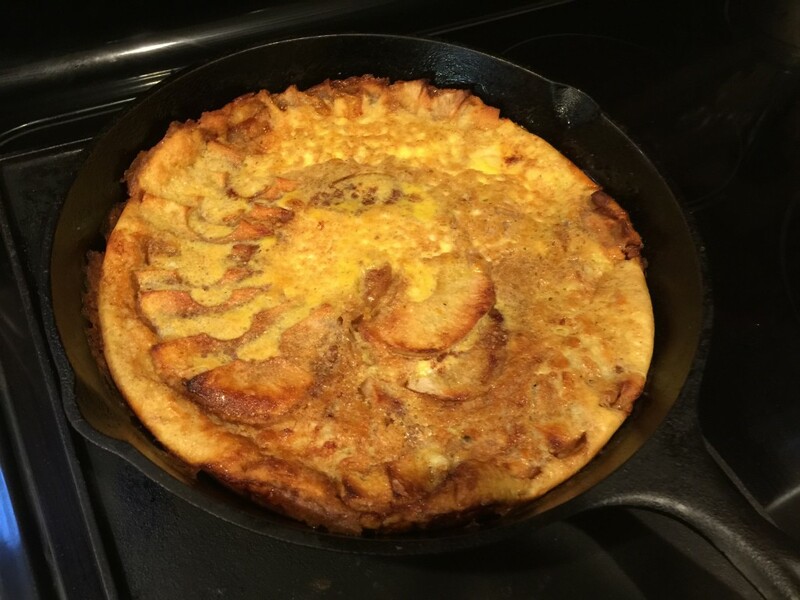 This apple pancake is one of our favorite fall breakfasts. My boys and six and eight enjoy making the pancake themselves. Get one of those fancy apple peelers and let them at it. I do the work with the hot cast iron skillet, but they like this pancake so much that they are willing (and able) to most of the work themselves. It’s fun to have the little ones happy in the kitchen. While oven is preheating, combine eggs through ½ t nutmeg in a medium bowl. This mixture can be made the night before and kept in fridge, ready to go for the morning. Combine ¼ cup sugar, cinnamon, and ¼ t nutmeg in a small bowl. When oven and skillet are hot, put ¼ cup butter in skillet and put skillet back in oven until butter is melted, about 3 minutes. Remove skillet. Sprinkle about half of the sugar cinnamon mixture over the bottom of the skillet. Remember skillet is HOT! Layer apples on top of the sugar and then sprinkle with remaining sugar cinnamon mixture. Put pan back in oven to bake apples for 10 minutes. Pour batter over the top of the apples and finish cooking until top is golden brown and apples are cooked, about 20-25 minutes.